I’m back and nutty as ever! No, I haven’t abandoned my post at the NutGourmet—just took a little holiday break to spend time with family and friends and cook up a flurry of great munchies I’ll share in future blog posts. Now, I’ve returned with a fresh vigor and a feverish desire to share the nutty pleasures. Sometimes I bemoan the fact that nuts are not exactly dirt-cheap. Then, on the other hand, maybe that’s a good thing because many of us would probably be tempted to gorge on massive amounts of them. That would be a bad thing. How bad? What constitutes a healthy level of nut consumption? The key is to remember there is awesome power in “just a little.” That “just a little” means there are potent benefits in consuming as few as one to three ounces of nuts a day. Translate that to the equivalent of about one or two generous handfuls. Some might be thinking that limiting oneself to just one or two ounces of nuts a day may actually feel like utter deprivation. In truth, that small quantity is actually achieving a perfectly healthy ideal. It never ceases to amaze me that such a small quantity packs a big wallop in knocking down high cholesterol and blood pressure and reducing the risk of coronary artery disease. 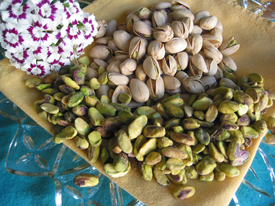 At the December 2009 meeting of the American Association for Cancer Research, attendees learned from researchers at Texas Woman’s University – Houston Center that a mere two ounces of pistachios a day boosted levels of gamma- tocopherol, a natural form of the powerful antioxidant vitamin E. The authors acknowledge higher levels of gamma-tocopherol may offer protection against certain forms of cancer, namely lung and prostate cancer. The U.S. Department of Agriculture and the Department of Health and Human Services update the Dietary Guidelines for Americans every five years. In 2005, the guidelines suggested incorporating 1.5 ounces of nuts such as hazelnuts into the diet several times per week. They suggest hazelnuts are a good source of vitamin E, magnesium, folate, B vitamins and minerals that may play a role in lowering blood pressure. 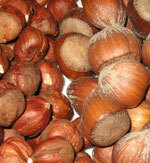 Hazelnuts are high in beneficial monounsaturated fats and only contain 4 percent saturated fats. Just two handfuls of walnuts a day was the catchphrase of a study looking to inhibit the growth of breast cancer tumors in mice. W. Elaine Hardman, Ph.D., professor of biochemistry at Marshall University School of Medicine in Huntington, West Virginia, gives the omega-3 fatty acids, antioxidants, and phytosterols in walnuts a thumbs up for their ability to block the progression of tumors and suggests the compounds contained in walnuts could slow down the growth of breast cancer in humans. 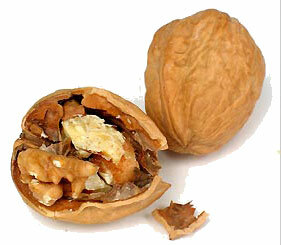 A study cited in the Journal of the American College of Cardiology demonstrated that just eight walnuts eaten at the end of a meal may be better than olive oil in helping to prevent damage to the delicate lining of the arteries. Walnuts were compared with olive oil in a study conducted at Barcelona’s Hospital Clinico and were found to better retain the elasticity and flexibility of the arteries when necessary to expand and increase blood flow. While many people turning to the Mediterranean diet credit the olive oil for the heart healthy focus, they miss the true hero—the little handful of walnuts. Must one conclude that nuts are truly a miracle food? No, they certainly are not. Nuts are merely one of many of the highly nutritious plant-based foods that help us to stay healthy and assist us in returning to a state of health when we’ve fallen into the pit of chronic disease. There really are no miracle foods, though many food purveyors work hard to convince people their product is theeee one to repair all the health ills and provide a cure-all. The power of the few remains the steadfast mantra referring to all whole, plant-based foods consumed in smaller portions than Americans have become accustomed to consuming. Feasting is best saved for special occasions. For the daily diet, the power of a few nuts along with comfortable and reasonable portions of fruits, vegetables, whole grains, legumes, and seeds brings impressive results in a surprisingly short time. American Association for Cancer Research “Walnut consumption decreases mammary gland tumor incidence, multiplicity and growth in the C(3) Tag transgenic mouse” AACR 2009; Abstract LB-247.